Do your loved ones want you to sleep in the attic? Have you heard the funny comments behind your back? You know, the ones about your snoring and other weird noises you make when you’re sleeping? Perhaps they aren’t being made behind your back. Maybe they’re to your face. Someone wants you to sleep in the other room… or the attic! Either way, comments about your snoring really aren’t that funny… they’re serious. That’s right. Sleep apnea. And that’s no joke. The repercussions of sleep apnea are quite severe, and in some cases they are life threatening. So you need to take action. Excellent question. The first thing to do is research a little bit about sleep apnea. You can find articles here at Toxic Habits – Sleep Apnea that talk about the symptoms, risk factors, dangers and treatments. Read through those articles and see if you fit the profile. The next step is to talk to your doctor. Start with your family doctor. There are still some general practitioners who don’t recognize the importance of diagnosing and treating sleep disorders like apnea. But thankfully that is changing. Your doctor will likely refer you to a sleep clinic that can test you for apnea or other sleeping issues. If they don’t refer you to a clinic, ask them to. If they still don’t, start looking for a new doctor or contact a sleep clinic in your area directly. The fact is, you don’t know if it’s only snoring until you’ve done a sleep study. Snoring is not always an indication of sleep apnea, but it could be. And it could be a precursor to apnea as well. Go take a quick look at the dangers of sleep deprivation infographic again. Do you really want to live with all that? For the rest of your life? I know the idea of getting wired up and sleeping in strange place with people watching you can creep you out. You probably think you won’t sleep anyway. But the technicians at the clinic make things very comfortable. It isn’t as bad as you imagine. Granted, it’s not the same as sleeping at home. One of the clinics I was tested at felt more like a hotel than a clinic. My, my… you’re full of questions today! The next step depends on what is discovered during your sleep study. If you do have apnea or another sleeping disorder, treatments will be proposed. You and your doctor will have to iron out what course of action you will take from there. For some, it may be as simple as losing weight (although that is not enough in most cases). CPAP or surgery may be required. And perhaps it’s only snoring after all. But at least you’ll know! 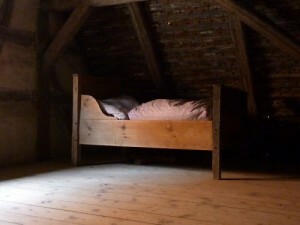 Bed in the Attic image by Seeman at mourgeFile. Bill (LoneWolf) Nickerson recently posted…I Think I Have Sleep Apnea — What Do I Do Next? Sleep apnea is no joke. I was diagnosed with it more than five years ago. I am treated with CPAP and it’s made a world of difference in my life! I’ve been living with CPAP for close to 15 years. I really notice the difference in energy levels if I can’t use it for some reason. It is amazing how much of a difference it makes!